Joy! The newest addition to my gallery of "girls." My daughter and her friend, A, got into the paints the other day, so I couldn't resist. I didn't have a plan, but after I sifted through my papers, my "vision" began to form. The colors just came together, and I tried new techniques. Well, mainly with her hair. I painted her hair a yellow first, then began layering various shades of brown. I typed the wording on the computer, which gives it a more finished look. Then drew in the stitches and "connected" the text pieces together. I linked up with Mary for Mosaic Monday today. Hmmmm. That definitely puts me in good company! wow. i love your art, friend. i just discovered you through "be yourself" but i will be back. so lovely. What a great painting. Love her hair and her whimsical expression. Your art is lovely. It must have been such fun to create to create this girl. Roban it must feel good to "play" with paper, paint and canvas again after a long year teaching. 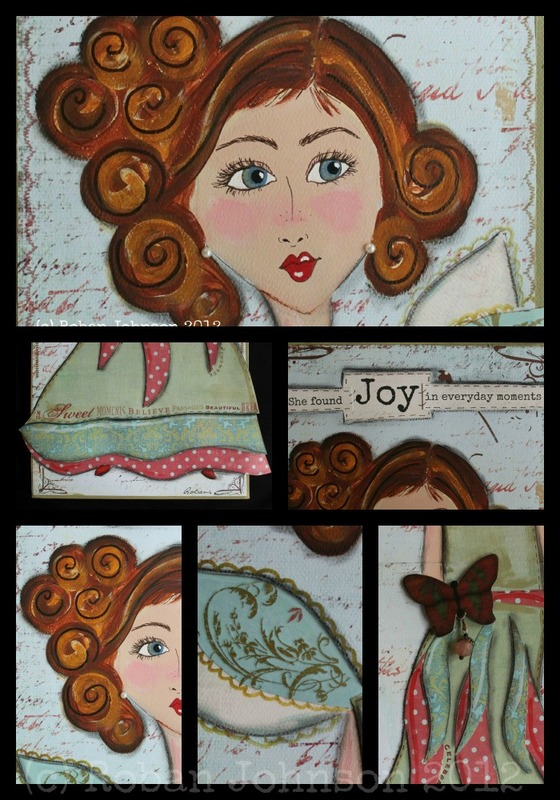 Joy is lovely with her blue eyes and brown wavey hair and a butterfly to boot! Oh, I love her gorgeous smiley lips and the twinkle in her eye. I think it should be called "Instafun"